This ticket allows standard access across the weekend for adults aged 18 and over to Rewind Festival and includes camping access for 3 nights (Fri-Sun inclusive). This ticket allows standard access across the weekend for youths aged 10 - 17 years old to Rewind Festival and includes camping access for 3 nights (Fri-Sun inclusive). This ticket allows standard access across the weekend for children aged 9 and under to Rewind Festival and includes camping access for 3 nights (Fri-Sun inclusive). This ticket allows standard access across the weekend for adults aged 18 and over to Rewind Festival and does not include camping access. This ticket allows standard access across the weekend for youths aged 10 - 17 years old to Rewind Festival and does not include camping access. This ticket allows standard access across the weekend for children aged 9 and under to Rewind Festival and does not include camping access. This ticket allows standard access on Saturday only for adults aged 18 and over to Rewind Festival. Day tickets do not include camping access. This ticket allows standard access on Saturday only for youths aged 10 - 17 to Rewind Festival. Day tickets do not include camping access. This ticket allows standard access on Saturday only for children aged 9 and under Rewind Festival. Day tickets do not include camping access. This ticket allows standard access on Sunday only for adults aged 18 and over to Rewind Festival. Day tickets do not include camping access. This ticket allows standard access on Sunday only for youths aged 10 - 17 to Rewind Festival. Day tickets do not include camping access. This free ticket allows standard access on Sunday only for children aged 9 and under to Rewind Festival. Day tickets do not include camping access. A quality tent are pre-pitched within the Boutique Camping Area and ready for your arrival. 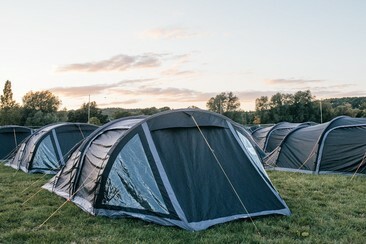 All tents come complete with self-inflating mattresses and sleeping bags for guests. Take pleasure seriously and check-in to the Boutique Village. Take advantage of exclusive facilities, including a 24-hour concierge, porter service, premium toilet and shower facilities, pamper facilities, Boutique Lounge and complimentary yoga and Pyjama Party fun! A Bell Tent is the perfect way to spend a weekend! Our Standard Bell Package is a 5m Bell Tent, allowing you to create your own Bell Tent experience in the most affordable way for you. These Bells come with no furnishings, but allow you to bring your own mattresses & bedding. 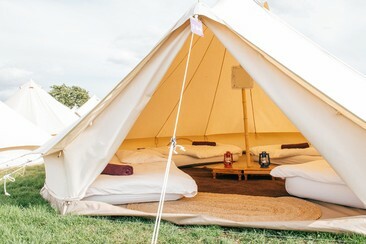 A 5 metre Bell Tent is 5 metres in diameter, 3 metres high in the middle with a 1.6 metre tall entrance. Take pleasure seriously and check-in to the Boutique Village. Take advantage of exclusive facilities, including a 24-hour concierge, porter service, premium toilet and shower facilities, pamper facilities, Boutique Lounge and complimentary yoga and Pyjama Party fun! Make the most of your camping experience and stay in one of our stylish and spacious Tipis! Our Standard Tipi package is a stylish single pole 16ft diameter Tipi, allowing you to create your own Tipi experience in the most affordable way for you. 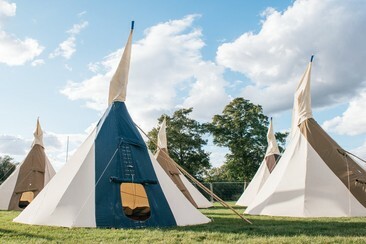 These tipis come with no furnishing but allow you to bring your own mattresses & bedding. This tipi includes: - Rain hat - Inner lining - Waterproof groundsheet - Carpet flooring - Waste bin - Entrance mat Take pleasure seriously and check-in to the Boutique Village. Take advantage of exclusive facilities, including a 24-hour concierge, porter service, premium toilet and shower facilities, pamper facilities, Boutique Lounge and complimentary yoga and Pyjama Party fun! Sleep under the stars at Rewind in one of our lovely yurts. The circular canvas tents are the perfect way to enjoy your camping experience hassle free! 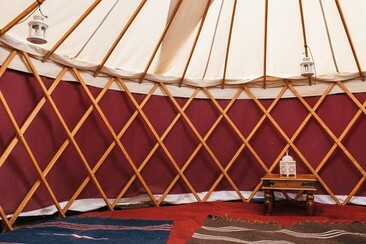 Our classic package includes a compact 9ft diameter Yurt. 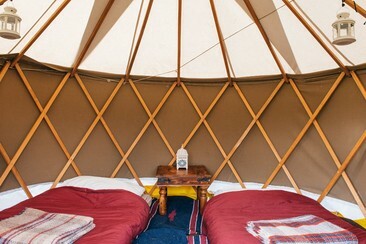 Classic yurt does not come with beds or bedding, so you will need to bring your own. The classic package includes: - Waterproof groundsheet - Carpet flooring - Skylight window - Waste bin - Entrance mat - Handwoven rugs - Rosewood table & lanterns Take pleasure seriously and check-in to the Boutique Village. Take advantage of exclusive facilities, including a 24-hour concierge, porter service, premium toilet and shower facilities, pamper facilities, Boutique Lounge and complimentary yoga and Pyjama Party fun! A Bell Tent is the perfect way to spend a weekend! The Classic Bell Package comprises a dressed 5m Bell Tent for optimum comfort complete with bedding. The Classic Package includes: - Comfy inflatable mattresses - A hanging vanity mirror - Low-level wooden bedside tables - Cosy block colour rug - Large battery operated central room light - An LED storm lantern for late night trips to the loo! - A jute doormat for muddy boots and shoes - A 13.5 tog duvet and pillows - Egyptian cotton bed linen - One Egyptian cotton bath towel per person A 5 metre Bell Tent is 5 metres in diameter, 3 metres high in the middle with a 1.6 metre tall entrance. Take pleasure seriously and check-in to the Boutique Village. Take advantage of exclusive facilities, including a 24-hour concierge, porter service, premium toilet and shower facilities, pamper facilities, Boutique Lounge and complimentary yoga and Pyjama Party fun! Sleep under the stars at Rewind in one of our lovely yurts. The circular canvas tents are the perfect way to enjoy your camping experience hassle free! Our premium package contains a snug 12ft diameter Yurt for luxurious comfort complete with bedding & beds. The Premium package includes: - Futon mattresses come with sheets - 13.5 tog duvets, pillows and wool blankets - Waterproof groundsheet - Carpet flooring - Skylight window - Waste bin - Entrance mat - Handwoven rugs - Rosewood table & lanterns Take pleasure seriously and check-in to the Boutique Village. Take advantage of exclusive facilities, including a 24-hour concierge, porter service, premium toilet and shower facilities, pamper facilities, Boutique Lounge and complimentary yoga and Pyjama Party fun! Make the most of your camping experience and stay in one of our stylish and spacious Tipis! 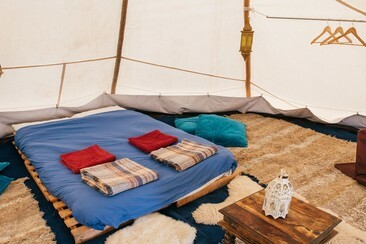 The Classic Tipi package comprises a traditional 18ft diameter Tipi for optimum comfort. 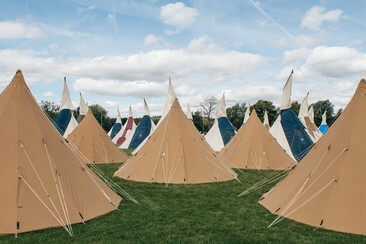 These tipis come with no furnishing but allow you to bring your own mattresses & bedding. The Classic Package includes: - Rain hat - Inner lining - Waterproof groundsheet - Waste bin - Handwoven rugs - Rosewood table & lanterns Take pleasure seriously and check-in to the Boutique Village. Take advantage of exclusive facilities, including a 24-hour concierge, porter service, premium toilet and shower facilities, pamper facilities, Boutique Lounge and complimentary yoga and Pyjama Party fun! A Bell Tent is the perfect way to spend a weekend! 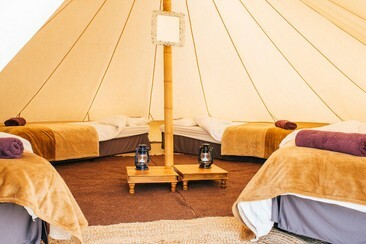 The Premium Bell Package comprises a dressed 5m Bell Tent for luxurious comfort complete with bedding & real beds. The Premium Package includes: - Real metal frame beds with comfy foam mattresses - A 13.5 tog duvet and pillows - Egyptian cotton bed linen - One Egyptian cotton bath towel per person - A hanging vanity mirror - Low-level wooden bedside tables - Cosy block colour rugs - Large battery operated central room light - A jute doormat for muddy boots and shoes - An LED storm lantern for late night trips to the loo! 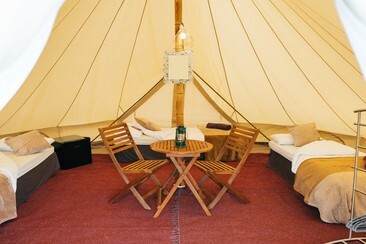 A 5 Metre Bell Tent is 5 metres in diameter, 3 metres high in the middle with a 1.6 metre tall entrance. Take pleasure seriously and check-in to the Boutique Village. Take advantage of exclusive facilities, including a 24-hour concierge, porter service, premium toilet and shower facilities, pamper facilities, Boutique Lounge and complimentary yoga and Pyjama Party fun! Make the most of your camping experience and stay in one of our stylish and spacious Tipis! 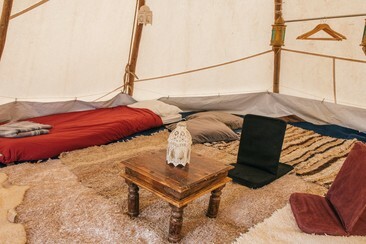 Our Premium Tipi package consists of a spacious 18ft diameter Tipi luxurious comfort complete with bedding & futon beds. Take pleasure seriously and check-in to the Boutique Village. The Premium Package includes: - Double or twin futon mattresses with sheets - 13.5 tog duvets, pillows & wool blankets - Rain hat - Inner lining - Waterproof groundsheet - Carpet flooring - Waste bin - Entrance mat - Handwoven rugs - Rosewood table & lanterns Take advantage of exclusive facilities, including a 24-hour concierge, porter service, premium toilet and shower facilities, pamper facilities, Boutique Lounge and complimentary yoga and Pyjama Party fun! A Bell Tent is the perfect way to spend a weekend! 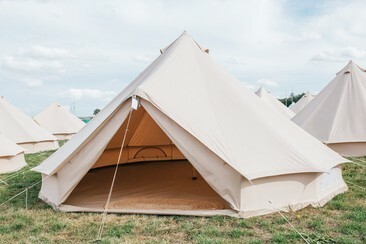 The Luxury Bell Tent Package is housed in a one of our beautifully dressed, spacious 6m Bell Tents, complete with real beds, sumptuous bedding & power for charging devices. The Luxury Package includes: - Real metal frame beds with comfy foam mattresses - A 13.5 tog duvet and pillows - Egyptian cotton bed linen - One Egyptian cotton bath towel per person - Wooden table and chairs - A hanging vanity mirror - Low-level wooden bedside tables - Cosy block colour rugs - Electrical powered central room light - A jute doormat for muddy boots and shoes - An LED storm lantern for late night trips to the loo! - Hanging clothes storage & clothes hangers - Power sockets for charging devices (UK socket) A Luxury Bell Tent is 6 metres in length, 4 metres wide and 3 metres high in the middle. Take pleasure seriously and check-in to the Boutique Village. Take advantage of exclusive facilities, including a 24-hour concierge, porter service, premium toilet and shower facilities, pamper facilities, Boutique Lounge and complimentary yoga and Pyjama Party fun! Make the most of your camping experience and stay in one of our stylish and spacious Tipis! Our Luxury Tipi package consists of a spacious 18ft diameter Tipi complete with beds, bedding & power for charging devices. The Luxury Package includes: - Double or twin futon mattresses with sheets - 13.5 tog duvets, pillows & wool blankets - Electric lamp - Electric sockets - Mirror - Coat hangers - Towels - Rain hat - Inner lining - Waterproof groundsheet - Carpet flooring - Waste bin - Entrance mat - Rugs & cushions - Rosewood table & lanterns Take pleasure seriously and check-in to the Boutique Village. Take advantage of exclusive facilities, including a 24-hour concierge, porter service, premium toilet and shower facilities, pamper facilities, Boutique Lounge and complimentary yoga and Pyjama Party fun! 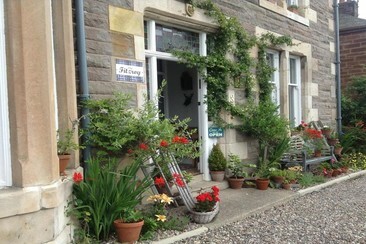 The Pitcullen Guest House is situated in the central belt of Scotland, just a 10-minute walk from Perth's center. 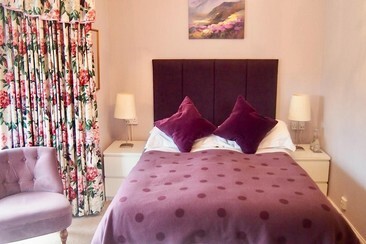 That's the reason why the property is an excellent base from which to explore the stunning scenery of the Scottish Highlands and Lowlands, beautiful lochs, castles, glens, Scone Palace as well as plenty cafés, bars, and restaurants. The rooms are designed in a smart way to give guests comfortable bright living spaces. They feature flat-screen TVs, mini fridges with complimentary bottled water & soft drinks, blackout blinds, tea/coffee makers, carafes of filtered water, hairdryers and free WiFi. Additionally, the hotel offers a guest lounge, bicycle/motorbike secure covered storage, drying facilities for bikers/hikers/walkers wet gear, packed lunches, and free car parking. Located within a 10 minute walk from the picturesque and vibrant city of Perth, The Fitzroy is a substantial detached villa set within a quiet residential area, whilst also being within easy reach of the bus and train stations, the Perth Royal Infirmary and all the many varied and diverse events and attractions. The Fitzroy hotel has two king size en-suite rooms, two double en-suite guest rooms and one single en-suite guest room that have all been recently refurbished and tastefully decorated. The hotel also offers ample private parking for guests. This beautifully furnished and spacious dining room is warm and welcoming with its real fire and collection of fine antiques and provides the perfect place for enjoying one of our famous freshly prepared full traditional or light breakfasts. Free private parking is available on site. This pass allows you to park up for the day or the whole weekend. Please select the day/s you wish to use this facility as space is limited. FRIDAY 12:00 - Car Parks Open SATURDAY 09:00 - Car Parks Open SUNDAY 09:00 - Car Parks Open MONDAY 14:00 - Car Parks Close Please note that the times may change. 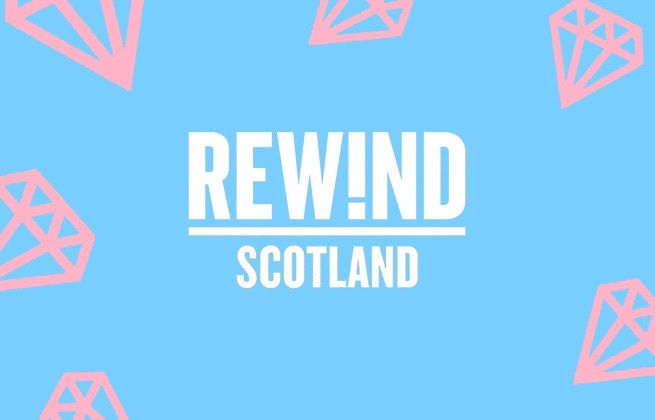 Rewind Festival Scotland is back at Scone Palace in July 2019, turning the palace near Perth into a playground of music, fun and games. Take a stroll around the beautiful Category A listed site, and you'll find performances from musical legends, themed venues and pop-up entertainment for all the family, whatever the age. 2019's lineup will include sets from legends such as Bryan Ferry, Foreigner and The Stranglers, as well as all sorts of quirky shenanigans, including the silent disco, pop-up pubs, comedy and karaoke. Scone Palace is a Category A listed historic house near Perth in Scotland.